Surprises might be fun on your birthday but definitely not on your construction project. Certainty and confidence is what we strive to provide. We're committed to giving you a building that looks and functions the way you need it to, while carefully managing to your schedule and budget. We call this "certainty of outcome," and employing a vertically integrated team enables us to deliver it. 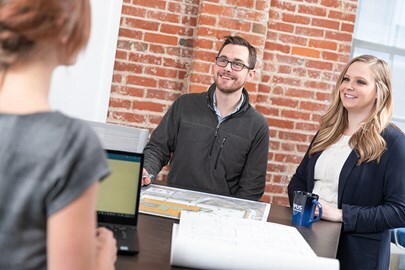 Having a vertically integrated team to deliver your project means that we have all the expertise needed to successfully deliver your project—architecture, structural engineering, interior design and construction—all right here, all in-house. With all functions under one roof, we leverage our design-build model to reduce your risk and uncertainty by locking in a guaranteed maximum price (GMP) earlier than other project delivery models can. This also allows us to manage the project scope and schedule to a tee, ensuring the end result meets or exceeds your expectations. With an early commitment to a GMP, a single point of responsibility for you and extensive relevant project experience, you can have confidence in us to deliver certainty of outcome for your project. The majority of industrial tenants need common features like good lighting, state-of-the-art dock equipment and efficient racking systems. Beyond that, each business is unique and has custom requirements to make the facility work for them. Because we oversee all aspects of the project, we can deliver certainty of outcome for clients. For example, at Laser Resources in Gateway Industrial Center in Grimes, Iowa, the ability to showcase the company's state-of-the-art printing equipment was of paramount importance. So as part of the design process, we worked with them to design a customized demonstration room with high ceilings, lots of natural light and plenty of display space. Close collaboration was key to successfully delivering Power Distributors' facility in Corporate Woods in Ankeny, Iowa. They needed a highly-efficient distribution center for their Midwest operation. Rob Smith, vice president of distribution and logistics for Power Distributors summed it up best when he said, "Opus was instrumental in helping us design the facility with the required features necessary to create a high-velocity distribution center." Iowa State University had a specific vision for Geoffroy Hall, its first new residence hall in more than a decade. Amidst a growing student population and increased demand for on-campus housing, they wanted to offer a dynamic living experience for students. It would require thoughtful, creative design, and the university wanted to be certain of the outcome. So they engaged with us. We spent time carefully understanding the University's project requirements and their overall goals and objectives. Then in collaboration with them and our construction professionals, we designed a building that went above and beyond delivering more than expected. Using our unique design-build model, we provided more than their minimum requirements, including 12% more beds (at a cost of up to 45% less per bed than similarly-scoped projects) and a lobby twice the size. The student-centered design provides natural light and ample study and social spaces. Construction was completed on a rapid 20-month schedule. When Xcel Energy needed a new regional headquarters for their division in Amarillo, Texas, they had specific requirements for a space that would better serve employees and their business—both now and in the future. From the start, we provided certainty of outcome for Xcel Energy, in terms of both price and outcome. A new headquarters is a huge undertaking that involves many decisions during the course of what is usually a long, complicated process. Due to a previous partnership, Xcel Energy entrusted us with their build-to-suit headquarters project. We delivered a flexible office space design for the 119,000-square-foot building that's customizable for up to 525 employees with room to grow. With 5,000-square-feet of ground-level retail space, LEED certification level features and a modern design, Xcel's new office is an attractive building for productivity and recruitment. When Kohl's purchased a building near its Menomonee Falls, Wis., corporate office for a wellness center, they engaged with another contractor to update the building. It wasn't long before it became evident the project had gone off the rails. The scope was wrong and the path to completion was unclear. They needed a new firm to take over the project that would provide certainty. So they hired us. We jumped in and accelerated the project, getting all the stakeholders on board to agree on the scope and budget. As with all projects, we committed to a guaranteed maximum price early, so there would be no surprises for Kohl's. We also devised a very tight turnaround for constructing the building, which we delivered on time. By listening carefully and employing our Opus DB3™ design-build model, we were able to understand their business and needs, ultimately delivering exactly what they envisioned for their wellness center.